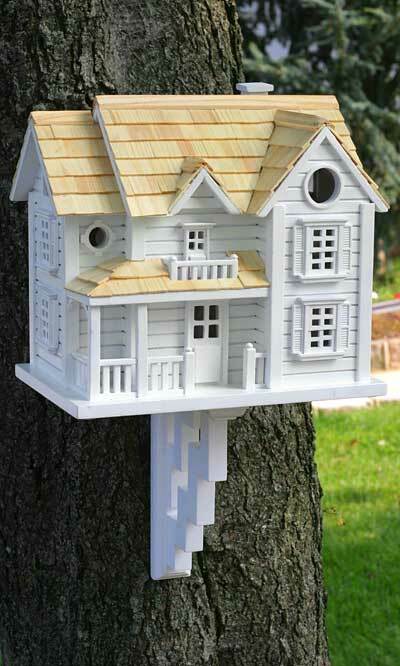 Let the classic beauty of the Home Bazaar Kingsgate Cottage Bird House invite feathered friends to your lawn. Crisp white paint coats the richly detailed exterior, offsetting the dark spaces of the paned windows. Shutters, window ledges, and porch railings create visual interest in the construction of the home. The natural finish of the wood shingle roof will patina to a silvery grey, adding to the charm of the house. The handcrafted Cottage features ventilation worked into the second floor's window details, ensuring your bird tenants' comfort. Bring the charming Kingsgate Cottage to your garden for a fresh update to your outdoor décor. Use the included mounting bracket to provide support to the house as you hang it on a wall or attach it to a tree or post. The back panel unscrews for seasonal clean outs.